We may remember the information revealed from the early days of the Disclosure Project. This project represented the effort to push for openness and honesty about the truth of ET life. At first it seemed that there wasn't much more to learn on the topic of disclosure. However, as time went on it became apparent that there was quite a bit more to the story. Dr. Bob Wood is one of numerous whistleblowers who were on the panel of witnesses and participated in the Disclosure Project hearings. It was assumed that the floor was completely open to whatever these witnesses intended to disclose. However, it has been revealed that whistleblowers such as Dr. Wood had more to say than allowed to be said. As it turned out, there was a good deal of testimony that was nixed from the Disclosure narrative. Any further information beyond this narrative was not allowed to be revealed during the interviews or the hearings. Fortunately, many of these whistleblowers authored their own autobiographies and memoirs so that the whole truth could be known. In many of these accounts, we find corroborating testimony to that of William Tompkins. Dr. Wood is just one of the many credible witnesses who have substantiated Tompkins' account, and in this second part of the two-part interview, both of these seasoned veterans give further detail on what they experienced. Many of us may have noticed at this point that there are intensive and continuous efforts to discredit alternative media. It seems that the powers that be are doing everything they can to spoil the rapid disclosure that is currently taking place. This suppressed information includes disclosures on the nation-wide pedophilia scandal and official corruption which exists at the highest levels of the U.S. government. Though it may be upsetting to learn about such efforts to hamper disclosure, these latest efforts are not the only attempts at suppression currently in play. There is also reported to be a constant effort to discredit valid whistleblowers who threaten the intended narrative of partial disclosure. 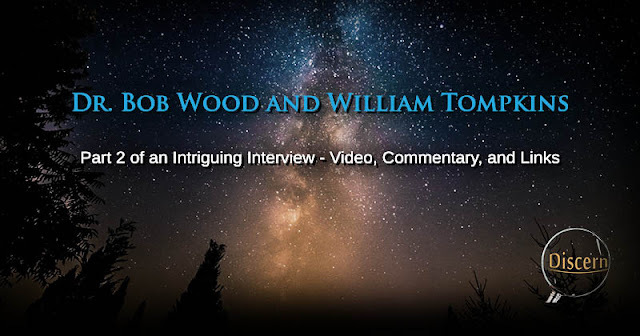 As we may have heard, personnel in the Secret Space Program and elsewhere have been hard at work attempting to discredit veterans such as Tompkins and Dr. Wood so that partial disclosure can proceed unhindered. These personnel do this only for the sake of maintaining their own power and influence over humanity. This is not at all fair or ethical in my view. The right to true information and the right to freely choose that information belongs to every one of us. As sentient beings, we have the right to grow and learn as we please without being interfered with by outside agendas of self interest. This is one of the many reason why I believe that partial disclosure is not at all in the best interests of humanity. It is because a string of half-truths only serves a few interests instead of the whole. To disallow we the people the opportunity to take control of our lives, these people only perpetuate the system of control we currently see in place. The control may change in some way, but it will not end. If we do not end it now, our children and grandchildren will likely be in the exact same situation we find ourselves in now (or worse). This cannot stand. In order to be free, we must claim our freedom against the will of anyone who attempts to hinder that freedom. If we choose to be sovereign individuals, we must stand up and demand that which has been denied us for decades of time. This requires forthrightness and honesty not only on the subjects free energy, the ET presence, and space travel, but on the entirety of crimes committed by Cabal interests in order to maintain secrecy. Much of the truth is coming forward, and it is up to all of us to see that the revelation is complete.